Juniors Anders Ekstrom (center), Lindsey Evans and senior Kate Langley. Lakehill has a long tradition of community service with students who give generously of their time and talents to make an impact on their communities. 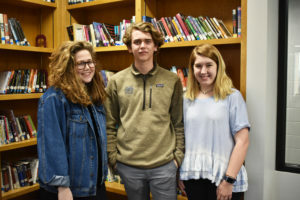 Three Upper School students, juniors Anders Ekstrom and Lindsey Evans, and senior Kate Langley were recently selected as honorees in the Prudential Spirit of Community Awards program for their outstanding volunteer efforts. Since the first grade, Ekstrom has been involved in monthly Shoreline Spruce-ups through For the Love of the Lake (FTLOTL), both with Lakehill and, more recently, with Dallas United Crew. He believes that small efforts over a sustained period of time can have a huge impact. “While most people would agree that picking up trash is not a glamorous activity, it is definitely one that makes a big difference,” he said. “After 11 years, I know that my efforts have paid off.” Ekstrom believes that it is important to clean up the lake because it is such a central part of our community. Langley has spent the past three summers volunteering at Theatre Three in a workshop for teens interested in acting. She attended rehearsals, helped construct props, assisted the stage manager in clerical tasks, and even ran the lights and projections. The Prudential Spirit of Community Awards represents America’s largest youth recognition program based exclusively on volunteer service. The awards, sponsored by Prudential Financial, Inc. in partnership with the National Association of Secondary School Principals (NASSP), honor outstanding community service by students in grades five through 12 at the local, state and national level. “By shining a spotlight on their service, we hope that more young people will be inspired to make a difference to the people around them,” said Prudential Chairman and CEO John Strangfeld.